Watches are one of the highest selling products in the marketplace today. But the way you display your watches will determine how many you sell from your store. Today, watches require a brighter and more spacious display system so that the customers can notice the choice pieces and be inclined to purchase them. We are the manufacturers, exporters, and suppliers of the best quality display systems for retail watch shops and offer an extensive range of Watch Display Solutions. 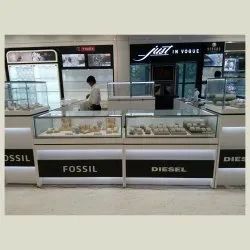 We specialize in Retail Outlets and also undertake the turnkey project from concept to design and execution.We make different kinds of Wall display Units, Front Counter, Cash Counter with Led Lights Profiles, Gondolas for display, Acrylic Display for watches. You can choose from a wide variety of finishes to accentuate your store’s personality. From Glossy Finish, Matte Finish or Duco Finish, we create the perfect display furniture based on your specific requirements. Looking for Watches Display Stands ?